In the final race of the U.S. racing season, Erik Bjornsen of Alaska Pacific University (APU) and U.S. Ski Team (USST) won his second individual race of the week at 2018 SuperTour Finals in Craftsbury, with a victory in the men’s 50-kilometer classic mass start on Wednesday for the U.S. Distance Nationals title. He previously won the 15 k freestyle mass start on Saturday. Bjornsen beat out Adam Martin of the Craftsbury Green Racing Project (CGRP) in the finishing stretch to finish first in 2:24:51.4 hours, 1.5 seconds ahead of Martin in second place. 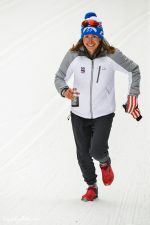 For the first 25 k of the race, about six skiers had been in contention while skiing together at the front of the field. By 35 k, that lead group had dwindled to three, with Bjornsen and his teammate Scott Patterson (APU/USST) leading Martin. Five kilometers later, Martin led the other two, and the three stuck together into the final 5 k lap. Ultimately, Patterson finished 22.8 seconds back in third place, ahead of another APU teammate David Norris, who came on strong while skiing alone on the last lap to close the gap to third, in fourth (+36.5). The rest of the field was strung out as they crossed the line, with Simi Hamilton of the Stratton Mountain School (SMS) T2 Team and USST placing fifth (+1:49.0), and his teammate Paddy Caldwell (SMST2/USST) following nearly three minutes later in sixth (+4:34.4). Kris Freeman (Caldwell Sport) finished seventh (+8:10.8), Tad Elliott (Ski Club Vail) placed eighth (+9:15.6), Ian Torchia of Northern Michigan University (NMU) and the USST Development Team was ninth (+10:26.3), and Canada’s Scott Hill (Team Hardwood) 10th (+11:00.2). In the junior men’s 30 k race, Ben Ogden (SMS) took the win in 1:29:17.6, while Hunter Wonders (APU) followed 17.2 seconds back in second place. Wyatt Gebhardt (Steamboat Springs Winter Sports Club) placed third (+1:46.6).